Maurice Murphy playing his trumpet. Photographer Suzie Maeder. Do you know what these two pictures have in common? 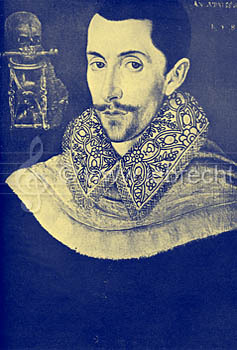 Early music fans on the internet think they are both portraits of Thomas Morley, the English composer (1557/1558 – 1602). 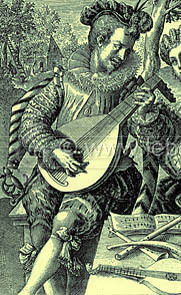 The Lebrecht Music & Arts early music specialist has identifed the first image as one of his contemporaries, John Bull (1562/1563 – 1628), and the second as a drawing from around 1600 with the costume indicating an Italian, rather than an English, source. Write to the Lebrecht Music & Arts Blog with any other musical misnomers that you have found on the internet. Vera Rozsa with her father Dr Ignacz Rozsa in 1956 in London. Vera Rozsa in Vienna 1948. Vera Rozsa taking singing master class in 1989 at Villcroze Music Academy, France. In anticipation of the much praised musical Fela! opening at the National Theatre in London on the 6th November 2010, Lebrecht Photo Library has newly acquired some very rare photographs of the great musician and pioneer of Afrobeat Fela Kuti, relaxing at home in Lagos with his many wives in 1978. Taken by the photographer Mike Wells. Fela Kuti. Photographer Mike Wells. For more images of Fela Kuti, please go to www.lebrecht.co.uk.